Vehicle-borne improvised explosive devices (VBIEDs) – or “car bombs”– use a vehicle as the package to deliver a massive explosion. These devices can cause extensive damage because of the large amount of explosives a vehicle can contain. However, when detonated near chemical plants or chemical storage facilities, the lethality and damage can be multiplied several times. To prepare chemical facility operators and emergency responders for VBIED risks, Nexight Group teamed up with Energetics to facilitate a tabletop exercise that simulates the events that would take place and the issues that would surface in a real VBIED situation. The tabletop was sponsored by the U.S. Department of Homeland Security Chemical Sector-Specific Agency in conjunction with the Pennsylvania Chemical Industry Council (PCIC). Although VBIEDs are often associated with the conflicts in Iraq and Afghanistan, these devices have caused significant harm here in the United States. The World Trade Center was first attacked with a VBIED in 1993, leaving six dead, and the 1995 bombing of the Murrah Federal Building in Oklahoma City by Timothy McVeigh resulted in 168 deaths. Earlier this year, a car bomb was discovered in New York City’s Times Square that could have killed numerous people and significantly damaged buildings. 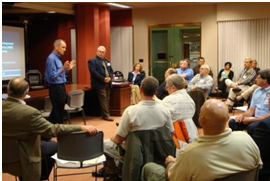 On October 7, 2010, Nexight Group facilitated a VBIED tabletop exercise at the State Capitol in Harrisburg, Penn. that included 45 participants from chemical companies, law enforcement, emergency management agencies, and federal agencies. The scenario is designed to examine three levels of action: the community around the local chemical facility, regional chemical facilities, and the entire chemical sector. The four-hour exercise was preceded by presentations on the psychological and behavioral aspects of terrorism, the history of VBIEDs, and th­reats to the homeland and the chemical sector. Mr. Eisenhauer teamed up with Jim McGinty, vice president of training and safety at Covenant Security Services, and Kate Finnerty, program director at Energetics, to facilitate the October 7 session. The tabletop exercise with PCIC is part of a larger effort by the Chemical SSA to partner with state chemical industry associations to prepare owners and operators, law enforcement, and emergency responders for a variety of emergencies, such as active shooter, hostage, and suspicious package situations.